How do social protocol amongst the sexes and status in society define a person’s reputation? Therefore, how does this reputation play the greatest role in marriage? How does this cause true love to be inconsequential? 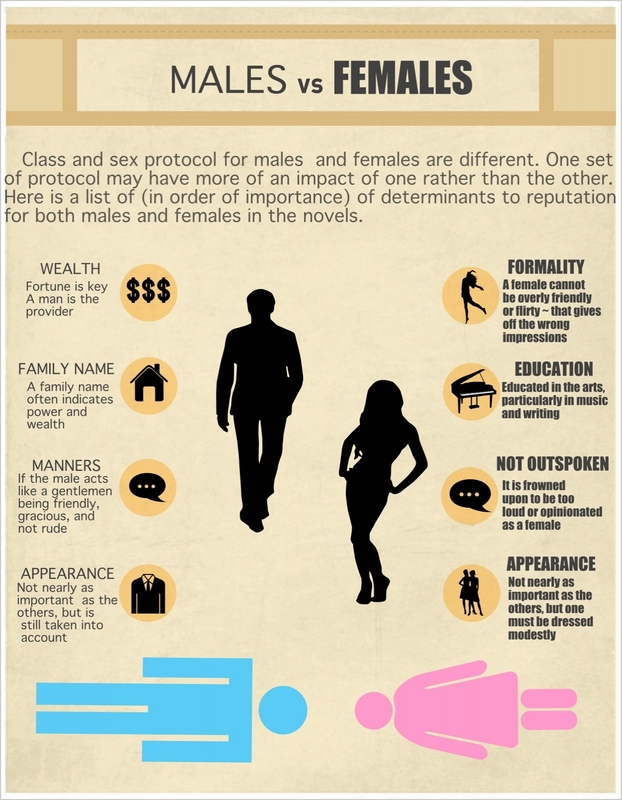 Social protocol deems what is appropriate in society for each gender in both novels. This protocol can be different for each gender. In addition, behavior dictating by societal rules is not the only factor because status also plays a key role. Status is dictated by wealth and family name. Therefore, as a whole status and social protocol by gender determine the reputation of a particular person in these novels. Determining a marriage partner is largely dictated by reputation in these novels. If someone has a reputation for being rich, they are seen as more appealing as a partner for marriage. In addition, if a girl has a bad reputation males will be warned that she is not a suitable partner. All of this decision making in marriage is based off of the idea of reputation in these novels. Since reputation plays the greatest role in determining someone to marry, true love is put to the side in these novels. They often portray the idea of true love as inconsequential. Two people do not have to be in love to get married. The most important factor is what status these people will be at, and what fortune they will have. Many people marry just for this reputation of wealth, rather than actually loving their marriage partner. This explains what I am trying to show relationships between in my inquiry. Social status and societal rules determine someones reputation. This reputation affects who one will marry. The direct cause and effect of each, leaves room for true love. So is true love inconsequential to marriage in the end? Daisy Miller = Shes completely uneducated. (21). Pride and Prejudice = Elizabeth…believed enough to make her former assurance of her sisters ruin still more certain (285). Pride and Prejudice = They agree with me in apprehending that this false step in one daughter will be injurious to the fortune of all the other (sc) for who, as Lady Catherine herself condescendingly says, will connect themselves with such a family? (287). In Daisy Miller, it is looked down upon to be friendly towards those who work for you. That is seen as something someone of low class would do. In wealthy society, it is simply improper, and those who engage in that type of activity are judged and frowned upon. In Daisy Miller, education is a key determinant in someones reputation. Often someones status is dictated off of how educated they are, and vice versa. Those who have access to a good education are generally wealthy members of society, especially a couple of centuries back when this novel took place. Daisy Miller is therefore judged, for she is ill educated. This affects her status and reputation. These are examples of inappropriate behavior that is a direct cause of Daisy Millers bad reputation. While in America, it may be okay to flirt with men. However, in Europe it is deemed as improper. Therefore, one must go by the social protocol of the area, or else judgements will be passed. Daisy Miller is a victim of these judgements through violating the social protocol of the European society. As explained above in the tree, education is a key determinant of reputation. Both males and females if ill educated as deemed as common. Therefore, their status is lessened, unless further educated. This, in consequence, affects reputation. In Daisy Miller, when Giovanelli says This system he is discussing social protocol of this particular country. American customs differ from European customs. Therefore , Daisy Miller must change her behavior to be suitable to European society, or she will (and she does) ruin her reputation. In Daisy Miller, the Millers are generally ignorant of their violation to social protocol. This ignorance causes them to be victims of the harsh judgement passed by other wealthy members of the society. Therefore, the whole family obtains a bad name. 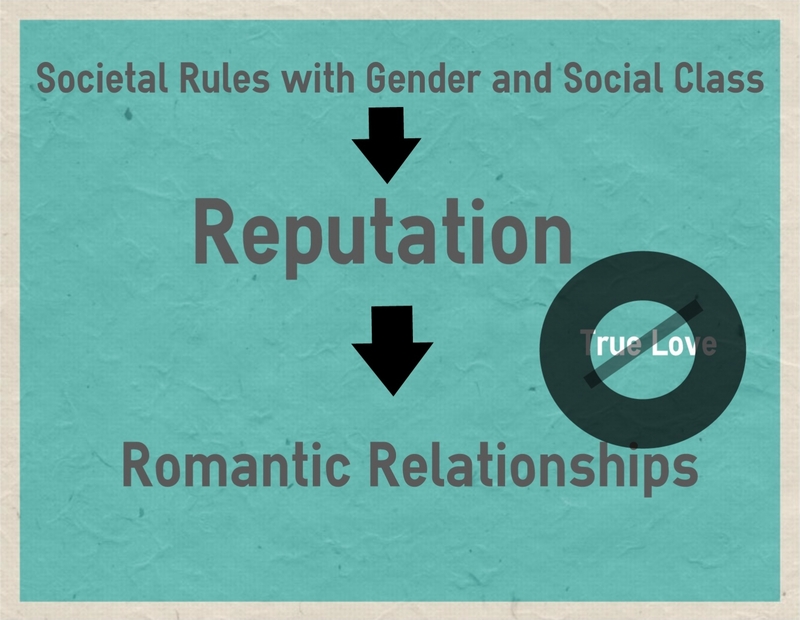 This is an infographic indicating the various determinants of reputation through social protocol and status depending on gender. One of the determinants of reputation for males in both novels is manners. Mr. Darcy, here, does not have the polite and friendly manners, and therefore his reputation is being tarnished. When Elizabeth walked to see Jane ill with the Bingleys, this was seen as socially unacceptable. A lady should not be walking around for a long distance when she should have taken a carriage. This is a violation of social protocol. Elizabeth walks to see Jane, and the Bingleys and Darcys begin to have an ill opinion of her behavior. She is adopting a wild reputation. In both novels, these skills line up with the key elements that determine a woman’s reputation. Lydia eloped, which is socially unacceptable, and therefore this causes the development of her bad reputation. Daisy Millers reputation begins to affect her relations with others. This behavior is socially unacceptable, and she begins to be talked about. People pass judgement against her, and her reputation is tarnished. Again, Daisy Miller is violating rules and society, and people are beginning to notice. This is showing the spread of reputation throughout the people in Daisy Miller. In this novel, this is yet another example of how reputation and fortune dictates a females interest in males. This is another example of the formation of a bad reputation. Mr. Darcy will not associate with those who are not of his status, therefore affecting who he can have potential relationships with. Apparently, Elizabeth can do no better than Mr. Darcy because he has such a large fortune. His rich reputation gains him interest from many females. Lydias elopement with Wickham is hurting the entire Bennet family. This reputation will affect future marriages, for no one will want to associate with a family with so reckless a daughter. Giovanelli is advised not to engage in relations with Daisy Miller because of her bad reputation and ill behavior. Giovanelli takes into account that Daisy Miller has a low social status. This affects the way other people see her. The Bingleys and Darcys are hoping Jane to have a fair chance at a fortune, but they feel as though their common reputation and minimal wealth may make it too difficult to find a marriage partner. This is similar to the quote above. The Bennet girls have less of a chance of marrying someone wealthy because they are not too wealthy themselves. Charlotte does not care about true love. She simply wants a to make a comfortable life for herself. Therefore, she marries Mr. Collins for security rather than affection. Elizabeth is talking about Wickham here. Everyone seems to accept the fact that he is solely searching for a marriage partner because of money. His fortune is minimal, and therefore he is seeking a wealthy partner. Lady Catherine is appalled that Mr. Darcy may marry Elizabeth. She views that her daughter should marry him, not because of feelings, but simply because she has a better status than Elizabeth. She is appalled that Mr. Darcy could consider someone so inferior. This is the argument Lady Catherine presents Elizabeth with as to why her daughter is a more suitable candidate to be Mr. Darcys wife. It is solely based off of reputation and status.